Encouraged as a youth to be as active as possible, a career in health education and health promotion seemed inevitable for Karl Larson. As an associate professor, chair and director of public health at Gustavus Adolphus College in St. Peter Minnesota, he has the opportunity to teach his students about the health education profession and help them think about why people behave and make health choices the way that they do. Before teaching future professionals, Karl was learning about health education himself. 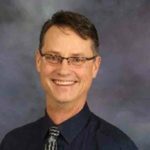 He completed a bachelor’s degree in therapeutic recreation from Minnesota State University-Mankato, followed by a master’s and doctorate in community health education from Southern Illinois University at Carbondale. After graduation, he found his way into higher education and eventually returned home to teach in Minnesota. Karl has appreciated the opportunity to allow young health education specialists grow into the profession. As an active SOPHE member, president of MNSOPHE and director of the Case Study Student Competition at SOPHE Annual Conferences, Karl demonstrates the importance of involvement in a professional development organization to his students. All of these opportunities allow him to help guide new and experienced professionals to their health education pursuits. When he is not working, he enjoys hitting a mile-long drive on the golf course and spending time with his wife Kathy and three children Danielle, Evan and Brenden.